ISE 2016 saw the launch of the world’s first IP studio monitor, the 8430 from Genelec. Based on RAVENNA technology for audio transport, and thus fully AES67-compatible, the 8430 is the culmination of many years of intense research since Genelec demonstrated its first audio-over-IP showcase system at ISE 2010. At the time the showcase was selected as one of the ‘Picks of ISE 2010’ as it was recognised as among the best new innovations presented at the show. Since then, much has happened in the world of audio-over-IP, including the publication of the AES67 interoperability standard in 2013. AES67 – and thus RAVENNA as the only natively AES67-compatible audio transport technology - is now fast gaining acceptance as the industry’s route to interoperability and is rapidly establishing audio-over-IP in the mainstream. The 8430 combines exceptional connectivity options; first, using a RAVENNA/AES67 signal, (the AoIP industry standard) via the XLR-housed RJ45 connector, and second, using a standard analogue signal via a balanced XLR connector. 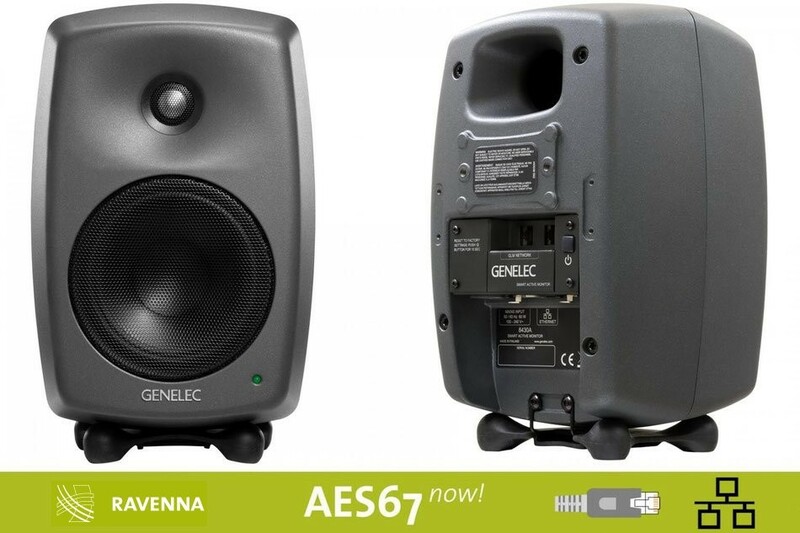 As part of the Genelec SAM Series, the 8430 shares identical electro-acoustic features such as Genelec MDE™ and DCW™ technologies, a flow-optimized reflex port, very low distortion, high SPL and wide, uncoloured response in a very compact enclosure - all this achieves the most accurate sound reproduction possible. Also, as member of the SAM Series, the 8430 uses the highly intuitive Genelec Loudspeaker Manager (GLM™ 2.0) control network and software which allows adjustments of all aspects of monitor settings and full system control. As a central part of GLM, Genelec AutoCal™ automatically ensures every monitor on the network is aligned for level, timing, as well as compensation of room response anomalies.